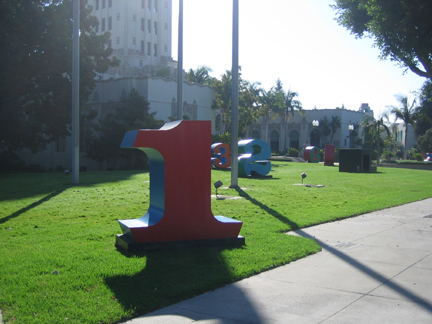 1980-2001, Robert Indiana. Figures arranged in front of the Beverly Hills City Hall. Text from the plaque: The exhibition represents the various phases of existence from birth to death. 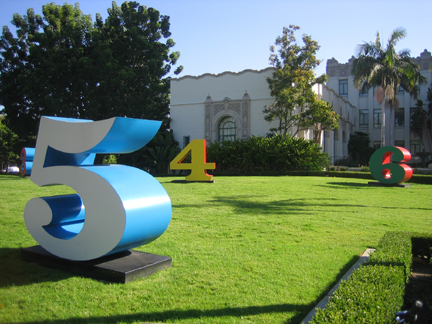 Ten numerals made of polychrome aluminum, 78" x 38" x 74". On loan through June 2005. Morgan Art Foundation. Artists Rights Society (ARS), New York. Courtesy of Paul Ksmin Gallery and Michael Kohn Gallery.